There are no sumo tournaments held in Kyoto, but there are tournaments held in Osaka (11 minutes away by bullet train) and Nagoya (40 minutes away by bullet train). Thus, you can easily enjoy sumo while staying in Kyoto. Sumo is not held in Kyoto but you can easily attend the March tournament in Osaka (11 minutes by bullet train) and the July tournament in Nagoya (40 minutes by bullet train). And, in January, May and September, sumo is held in Tokyo, which is only 2.5 hours from Kyoto by bullet train. For all the details on sumo in Osaka, see our Osaka Sumo page. For all the details on sumo in Tokyo, see our Tokyo sumo page. And, for some general details, continue reading this page. 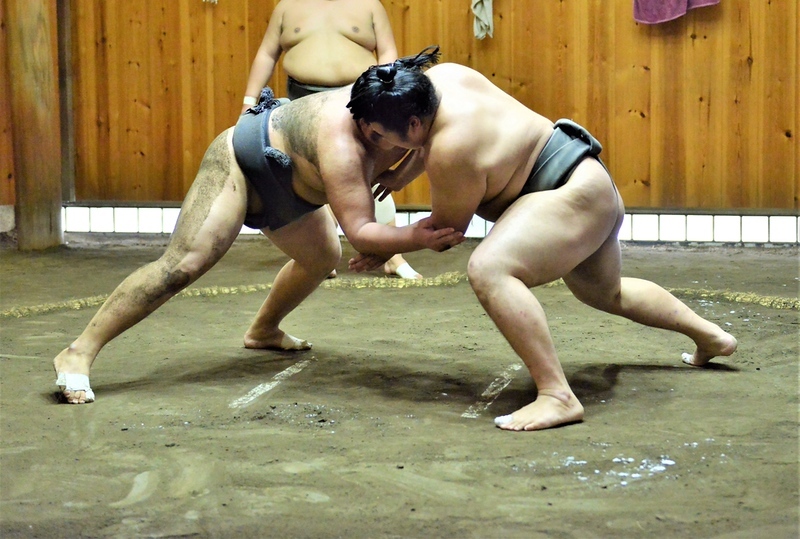 It is possible to buy tickets for sumo in person at the stadium on the day of a tournament. These are called “tojitsu-ken” (same-day tickets) and they are sold at a box office right at the sumo stadium where the match is being held (Nagoya, Tokyo, Osaka etc). But, keep in mind that you must show up early and stand on line and tickets might sell out before you get to the front of the line. Your best bet is a weekday match early in the tournament (later matches and weekend matches attract more people and sell out earlier). Tojitsu-ken go on sale for that day’s matches at 8.20am at the stadium, but you should be there at least an hour early to have a chance of getting tickets. And there is a limit of one ticket per person. Thus, if you’re starting from Kyoto, it will require an early start and a shinkansen ride to get to the stadium in time to buy tickets (and you’ll probably only succeed for weekday matches early in the tournament). A better option is to use the Ticket Oosumo service described below in the Online Advance Ticket Purchase section. The best seats are on the shomen (north section). The south seats are also good. The east and west side seats have worse views. You can purchase sumo tickets in advance at the English-language site Ticket Oosumo. This is a reliable service that allows you to buy your tickets online and then pick them up at the stadium in question. English bout schedules are available at the stadium. Entry is possible from about 8.30am. The best matches (upper ranks) happen between 4pm and 6pm. You can descend to the good masu or even tamari seats before their actual ticket holders arrive. In the masu/tamari seats, you must take off your shoes and stow them behind you in the shoe storage area.